This guide provides an introduction to library resources and how to find, evaluate, use, and cite them. 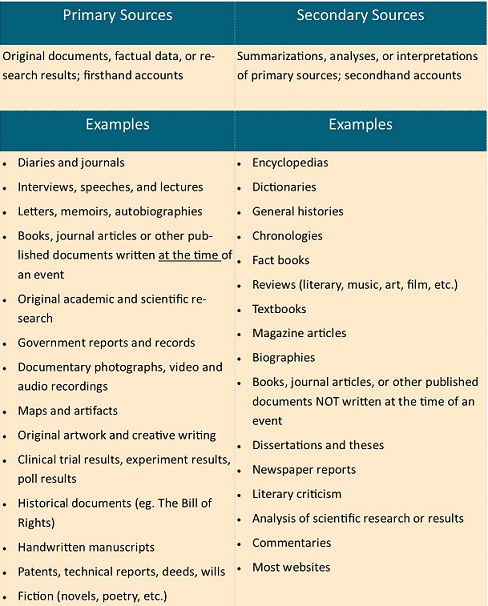 The chart below explains the differences between primary and secondary sources. These sources are organized in SC4 Library according to the chart below. If you have any trouble finding a source, please ask a librarian! For any other resource type not listed here, type your search term into the OneSearch box, hit enter, and then you will be able to refine your content by type. Achievement Center ~The Achievement Center offers test preparation, tutoring, study skills and tips, and disability services. Borrowing Items from the Library ~ Circulation policies, fines, and guest user information. Book a Study Room ~ The library features multiple group study spaces, available for use by students, staff, and faculty. Canvas ~ Log in to Canvas, SC4's online study program. Glossary of Library and Technology Terms ~ Macomb Community College put together a very useful list of common library and technology terms and their definitions. Interlibrary Loan ~ Students, Faculty and Staff may request a copy of an item that is not directly available in full text through SC4 library. Math Center ~ Get math help Mon-Thurs 9 am-4:30 pm in Room C100, College Center (across the hall from the library). Printing and Copying Information ~ The library has two black and white printing stations, one color printer, and a copier/scanner that prints both letter and ledger size. Study Skills and Test Anxiety ~ Helpful links for academic success. Textbooks on Reserve ~ SC4 Library has select textbooks for current courses on reserve. Writing Center ~ Busy students find the assistance they need at the SC4 Writing Center, located in 313 Main Building. Office 365 ~ With Office 365, you will have access to all of the Microsoft Office applications to either use in your web browser, or to install on your computer. You will also get free cloud storage using OneDrive (up to 1 TB) and a selection of other Microsoft applications. Sign up using your SC4 student email.